Surprising at every turn, Marvel’s new spinoff throws shade at the white-bread business of blockbustering. For all their global dominance, everybody wants these superhero movies to be better: funnier, smarter, more inclusive, more super. A huge step in the right direction, Black Panther is that dream come true. Proudly African—even if its Africa comes in the form of the fictional country of Wakanda, a powerhouse of secret technologies—Marvel’s latest is, from top to bottom, a conscious reversal of racial paradigms. Handsomely mounted by Creed director Ryan Coogler and starring an enviable slate of black actors that makes cameoing comics godhead Stan Lee almost seem lost, the film is provocative and satisfying in ways that are long overdue, like its ornate, culturally dense production design and the deeper subtexts of honor, compassion and destiny. Wakanda’s young king, T’Challa (a dignified Chadwick Boseman, well-seasoned after playing onscreen versions of James Brown, Jackie Robinson and Thurgood Marshall), recognizes that the world outside his peaceful realm is a divisive place. 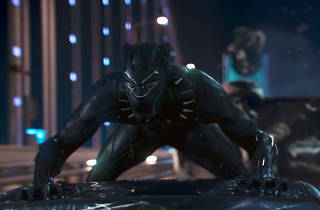 Still, even as his own armor-clad excursions as Black Panther set up an internal tension between isolationism and responsibility (yes, this is the rare blockbuster with something on its mind), tensions within Wakanda—fomented by exile-turned-rebel Erik Killmonger (Michael B. Jordan, on fire)—threaten to bring him down. 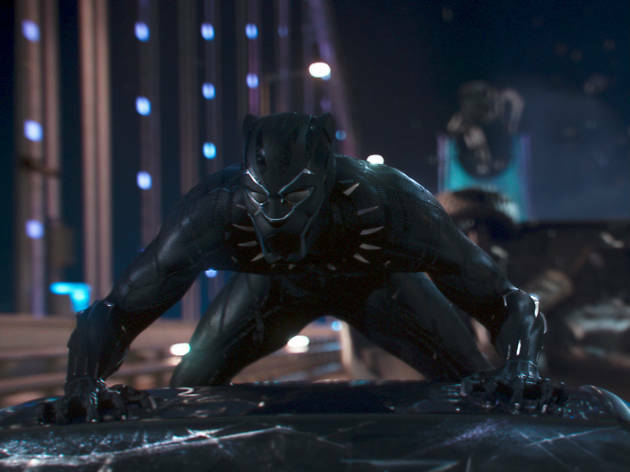 In their script, Coogler and Joe Robert Cole take inspiration from the Black Panther’s 50-year history on the page, including a dazzling current run by author Ta-Nehisi Coates, and the film plays like an alternative Macbeth, with characters riven by ambition, righteousness and the hum of supernatural forces. Black Panther comes loaded with pleasures big and small, such as The Walking Dead’s fierce Danai Gurira (made even more arresting without her trademark locks) charging into hand-to-hand combat and a regal Angela Bassett lending grandeur to her every conflicted pause. For all the movie gets right, it stumbles on the battlefield, tripped up by Marvel’s typical bloodless chaos, though the deliriously funny sight of rampaging war-rhinos goes a long way toward earning our forgiveness. The scale and ambition here is huge: Coogler isn’t quite a builder of epic action sequences, but he’ll get there. Yet you’ll thrill to the plot’s consistent movement toward something internal, a metaphorical sense of purpose in a spandex universe not known for being risky. Let the studios take notice. We come to the multiplex to dream, but that doesn’t require that we check our brains—or real-world tensions—at the door. A stealth detonation at the heart of popular entertainment, Black Panther feels like the future. This movie was AMAZING. It was like 2 movies in one - a superhero marvel movie + a commentary on social issues. I don't want to spoil it but it's definitely worth seeing twice. Tt was absolutely not racist but rather pointing out injustices that everyone knows exist in a subtle and very classy way. The best superhero movie i've seen in years but amazing costumes, music, fight sequences everything. Horribly boring! Had heavy-handed racist tones as well. Can't movies just be entertaining?